across the Bagmati river, was a fulcrum of Buddhism in the Kathmandu Valley and a great centre for art and architecture, legend stating that it had been founded by the Indian Buddhist emperor Ashoka in the 3rd century BC. It was a prominent centre of the Licchavi dynasty (300-800AD), but most of its monuments date from the Malla dynasty (1200-1769) in whose time the Valley was divided into three city-states of Kathmandu, Patan and Bhaktapur, each embellished with Darbar Squares at their hearts, filled with palaces and temples. 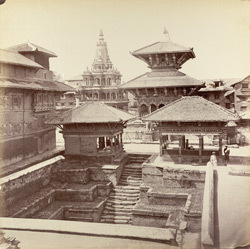 This photograph of the northern end of the Darbar Square at Patan shows the Vishveshwara temple on the right and the Krishna temple with its Garuda pillar facing it, both dating from the first half of the 17th century. In the foreground is the depression of the Manidhara, an ancient well dating from the 6th century. A woodcut version of this photograph was published by James Fergusson in 1876.